What if my friendships controlled the lights in my home? 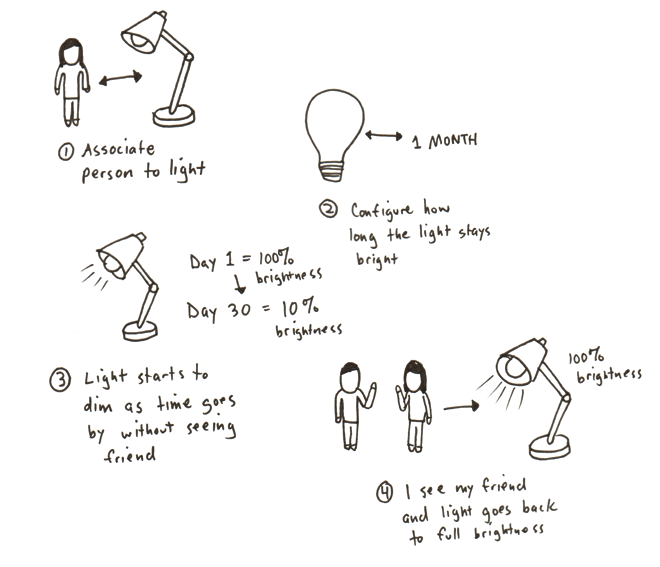 TL;DR — Using smart lights, I made each light in my home represent a person in my life, where each light’s brightness is determined by how long it has been since I’ve seen that person. The more I see my friends, the brighter my home. Click here to see a virtual representation of my lights. How do I gently remind myself to see friends that I’d like to see more often? As we become older, we become busier, move farther apart, start relationships, or start families. As a result, it becomes harder to see friends as much as we’d like to. Personally, I have tried to fight this trend with a Google spreadsheet. It is cold and impersonal: there’s just something about viewing a list of your friends in a spreadsheet (the same technology I use to keep track of my financials) that is off-putting. 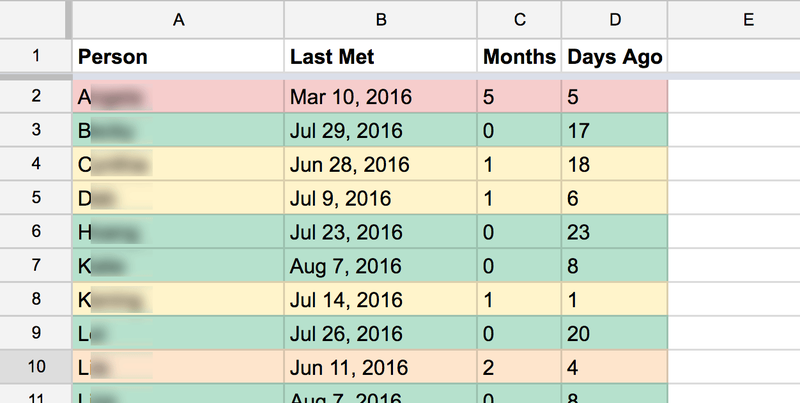 It is quantitative: with a spreadsheet, you are obliged to put everything in hard numbers: exactly how often you want to see certain people, exact days since you’ve seen someone; you even have to order the list of people in some way. It requires active management: and because of the above reasons, it wasn’t always pleasurable to maintain the spreadsheet, so it became a bit of a burden to manage. And then there’s always the question, “Why do you need to remind yourself? Shouldn’t you see your friends because you want to see them?” I agree with this in theory, but I have found in practice if I don’t actively remind myself to reach out to certain friends, I will always see them less than I want to. The spreadsheet was less of a tool of motivation and more of a tool of insurance: a stopgap to prevent too much time from passing between meetings with friends. Essentially, the goal is to match how much I want to see a friend to how much I actually see a friend. When leaving it to happen “organically,” these two things rarely match, and generally bias friends who are more outgoing or closer in proximity. That’s the double edged sword that is the spreadsheet. It puts those tough questions up front: who do you want to see and how often do you want to see them? I began by thinking about #2. How I can embed these reminders in my everyday life? I identified a part of my life that is the most comfortable and in my control: my home. So how can I embed reminders of my friends in my home? I then thought about the rhythms in which I wanted to see certain people (every week, every month, two months, etc) and what in my home can correspond to those rhythms. For example, how often do I get new coffee filters? How often do I replace my bed sheets? How often do I shake out my rugs? But this exercise quickly became complicated, cumbersome, and problematic. Who wants to be associated with how often I get more toilet paper? But there was one set of household objects that stuck with me: the lights. Lights are vital yet subtle objects. They play different roles in my home and I need them at different rhythms throughout different parts of the day. When a light goes out, I simply replace the light bulb, not throw out the whole light. Furthermore, light bulbs come in different types (incandescent, CFL, LED), wattages (15W, 40W), brightnesses (lumens), hues (soft, bright), and efficiencies (energy-efficient, LED, traditional incandescent.) Some provide more light, some provide a different kind of light, some need more maintenance than others. I believed this was a strong metaphor for my friendships and should be the basis of my solution. What if each light in my home represented a different person in my life and each light’s brightness represented how long it has been since I’ve seen that person? So if I haven’t seen someone for a long time, the light would start to dim, and right after I see that person, the light would return to full brightness. The more I see my friends, the brighter my home will be. The first problem was that I didn’t have too much control over the existing lights in my home. I didn’t have dimmers and light bulbs go out at unpredictable intervals. Luckily, there exists so-called smart light bulbs. 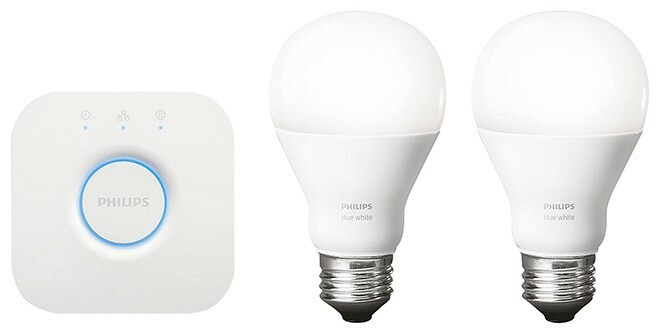 These are light bulbs that you can control using apps or computer programs via your home network. The most popular one at the time of this writing (and the light bulb I ended up using) is Philips Hue. After purchasing some smart light bulbs, the next task was to assign lights to friends. To be practical, I had to eliminate functional lights (bathroom lights, work lights, kitchen lights) and just focus on ambient lights. I couldn’t have my friendships be a nuisance by restricting light when I needed it. I distributed the available lights in my home to different friends with no particular logic. I just treated it as an exercise of free association. Some people just feel more like a dining room light or a living room light. 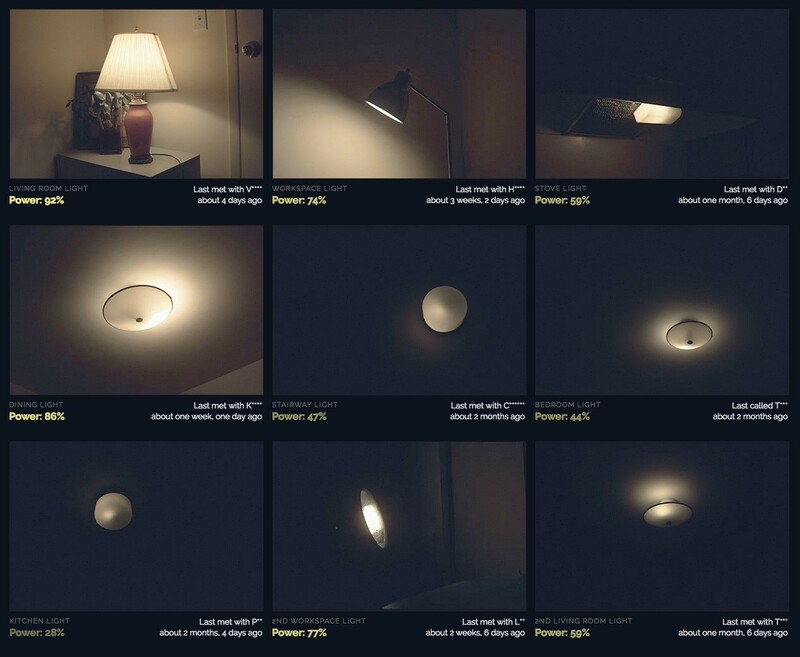 I then wrote a simple app that manages the light bulbs’ brightnesses. I configured each light to have a certain energy efficiency, i.e. how long does it stay bright before I have to “replace” the light bulb (i.e. see the friend associated with that light.) This would generally range between one month and three months. So after I see a friend, I simply click on the virtual light in my web interface to indicate that I saw the person the light represents, and the brightness of the corresponding physical light goes back to 100%. It would slowly dim down to about 10% after one to three months depending on how it is configured. Since I just implemented this, I don’t have too much to report except my immediate reactions. First, getting off the spreadsheet has been great. I like being relatively hands-off and not have to remember to check on something constantly. It may just be the novelty of it, but I have been making plans to see friends more often. One positive side effect of this project is that associating household objects with friends gives a steady sense of their presence. These personified lights act as constant reminders of people in my life, and my desire to reach out comes more frequently even if the light is still bright. I think sometimes we just need triggers to think about people to take the next step and reach out. Usually this is what happens when it happens “organically.” A picture triggers a memory, an article reminds you of a conversation, a TV personality reminds you of someone’s likeness. A trigger often comes as a result of chance, not choice. A stripped-down version of this project would simply be to associate people with objects in your home. One thing I’d like to do in the future is eliminate the need for a web interface (that I used to control and manage the lights) altogether. One way is giving each of my friends a “smart button” (like an Amazon Dash Button), a button that you can program to perform arbitrary functions. So when I see a friend, they can simply press the button and their light in my home goes back to 100% brightness. A slightly more privacy-violating method would be to track our respective locations via GPS; if we are in the same place at the same time, their light can be triggered automatically with no manual input. If you would like to set this up for yourself, I have published all my source code in a Github repository. I also have a virtual representation of the lights in my home which should reflect the current status of how long it has been since I’ve seen my friends. 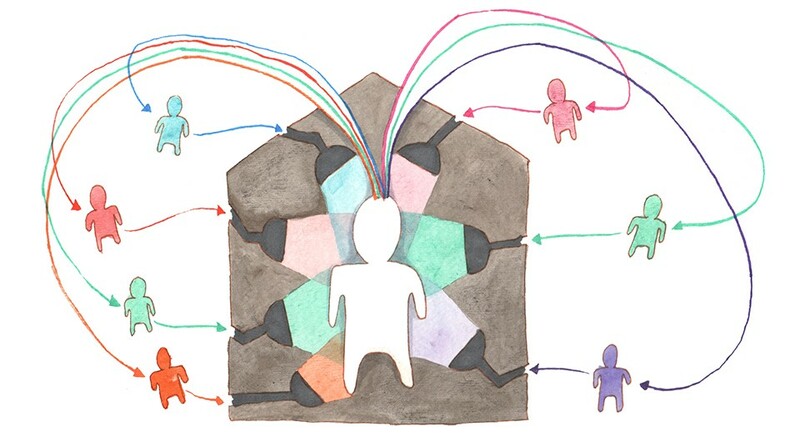 This experiment is reposted and part of a larger series called Friend R&D by Brian Foo which explores creative and technological solutions for the challenges of being a good friend. Learn more.